All students in the Centre will undertake a unique training course, specially designed with the aid of our partner organisations, it will provide a strong theoretical and practical grounding in the techniques, tools and languages of DIS, in both academia and industry. Students will develop a unique skillset covering DIS in both academia and industry, will form key contacts and networks in both areas, will work with cutting edge technologies and will be equipped to become world-leading data scientists. An overview of the training provided in the fours years can be found below. A 30h course on Research Software Engineering with Python or C++. A 30h course on Statistics and Data Analysis. One of three 30 hour modules on: Computational and Simulation Methods, Numerical Optimisation or High Performance Computing. A 30 hour course on Machine Learning with Big Data. 60 hours of specialist scientific courses tailored to the student's project, from: the HEP graduate programme, the Astrophysics graduate programme and modules from the MSc/MSci courses registered in Physics and Astronomy/Space and Climate Physics. The core of the studentship will consist of a research project, focussed on DIS research areas within the STFC remit. Many of the projects involve preparation and exploitation of facilities supported by STFC, such as ATLAS at the Large Hadron Collider, Planck, Gaia, DES, DESI, Euclid, the Square Kilometre Array, LSST, ALMA and JWST amongst others, which as well as carrying out ground-breaking research, are also ideal training grounds for DIS. The studentships will involve a 6 month secondment at one of UCL's DIS partner organisations, who are either power users or world leaders in DIS techniques, such as the BBC, The Economist, The MET Office, CERN openlab, NCC Group, Starcount, Lenovo and Mellanox amongst others. The work undertaken as part of the internship will be entirely separate from the research work for the thesis and will be focussed on a project proposed by the partner orgnaisation. A four month long project based on real-world DIS problems provided by our partner organisations, who will provide both their data and expertise. The project will be performed in self-selected groups of 3 or 4 students, overseen by an academic from UCL and a mentor from the partner organisations. The students will attend a DIS Summer School in their 1st year, covering data science tools/technologies used by our partner organisations, GPU programming and other hardware acceleration technologies. In addition they will attend an international summer school in their 3rd year related to their research project. Software Carpentry: basic introduction to: bash scripts, git, databases, software use. Data Security and Privacy Workshop: provided by two of our partner organisations, NCC and Privitar, who are world leading experts in their respective fields. Additional workshops on specific DIS topics (for instance machine learning, GPUs, code profiling and optimisation, FPGAs), will be provided at regular intervals throughout the studentship. 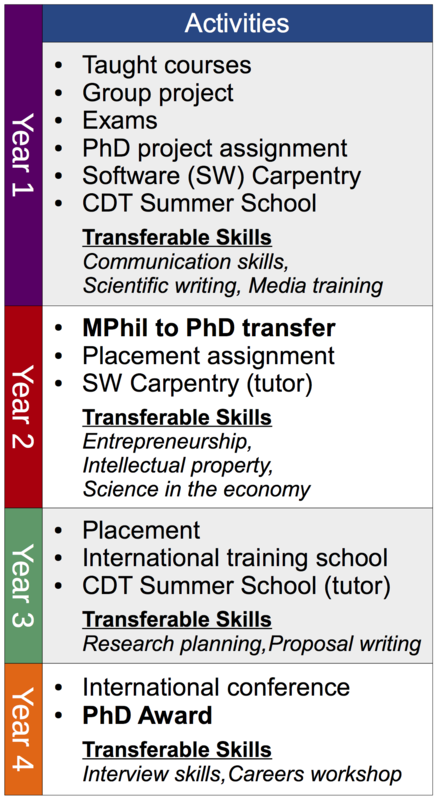 An overview of the four year lifecycle of a typical studentships.